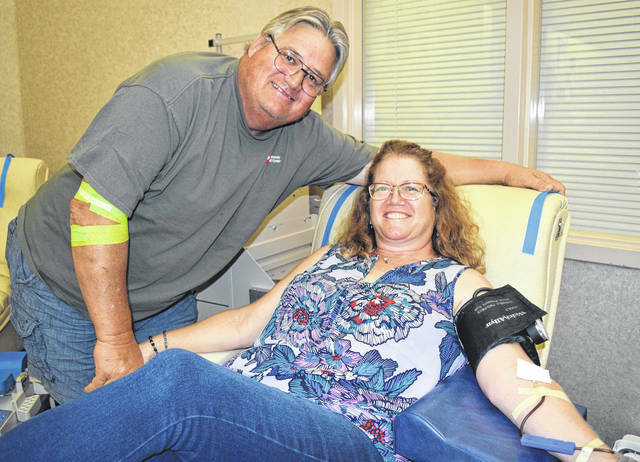 JAMESTOWN — Paul and Becky Carver celebrated their 34th wedding anniversary Aug. 24 by donating side by side at the Dayton Community Blood Center. Paul is retired and he lets Becky set the schedule for their “his and hers” donations. Paul first started donating years ago with his electricians union. He made his 31st lifetime donation Aug. 24, while Becky made her 52nd. Becky is a type O negative “universal donor” and both are CMV-negative, a preferred attribute for pediatric patients. “I can give to babies,” said Becky. Paul and Becky, Jamestown residents, have three daughters and three grandchildren and two of their daughters are currently pregnant. Two of their grandchildren were born a day apart, and they do their share of babysitting. They completed their anniversary celebration with a visit with the grandkids before an evening of dinner theater.